Fiction and creative writing – These are my own offerings of short fiction. History – I love history and share about what fascinates me. World wanderlust – This is my travel writing section. I enjoy words, history, bold landscapes, good company, laughing, art, coffee houses, rooms filled with books, maps and adventure. Please always feel free to comment, share opinions or stories, or just say hello 🙂 I hope that all those who read my blog will find in it something that is good. You can also look at my history blog (meganabigail.blogspot.com). I no longer add to it but there’s numerous posts on all sorts of interesting topics like the Boers in Patagonia, the world’s first subway, and the origin of the ‘Keep calm and carry on’ fad. You remind me of Courtney Thorne-Smith who played Cheryl in the sitcom “According To Jim”. And if those are your steps leading down to the beach, I totally envy you. My dream house has steps going down to the beach. Those aren’t my private steps (though wouldn’t that be lovely!). 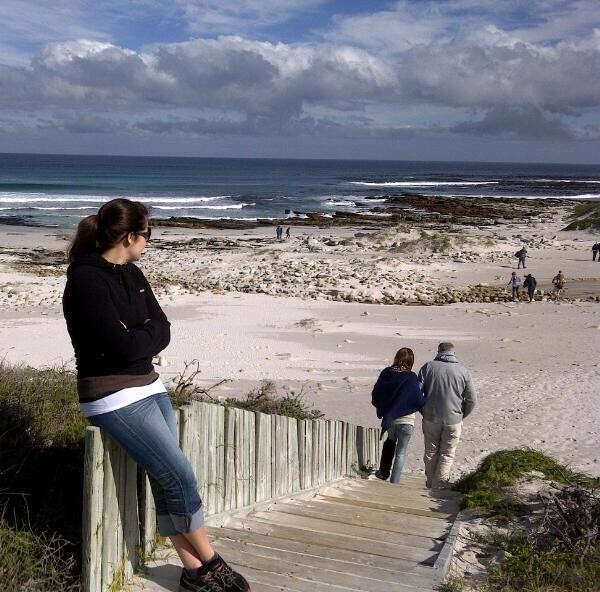 They’re on the west coast of the Cape Peninsula, inside Cape Point Reserve, a little over an hour from Cape Town. It’s very quiet and isolated there, and we shared the beach that day with only a handful people, some buck and a stalker ostrich! Ah, at least you got to go there. I would love to see that area, especially in the autumn. I’ll bet it’s gorgeous!